the Big World Blog: Britain to leave the EU? Britain to leave the EU? "Great Britain" came a step closer to deciding it's place in the European Union when Prime Minister David Cameron delivered his long-awaited speech on the EU. It would seem that although there are some provisos Britain and the British public may decide on the fate of the country's inclusion within the European Union. Below are some of the key points of Prime Minister Cameron's speech made in London 23/01/2013. "What Churchill described as the twin marauders of war and tyranny have been almost entirely banished from our continent. Today, hundreds of millions dwell in freedom, from the Baltic to the Adriatic, from the Western Approaches to the Aegean. And while we must never take this for granted, the first purpose of the European Union - to secure peace - has been achieved and we should pay tribute to all those in the EU, alongside NATO, who made that happen. But today the main, over-riding purpose of the European Union is different: not to win peace, but to secure prosperity." "I never want us to pull up the drawbridge and retreat from the world. I am not a British isolationist. I don't just want a better deal for Britain. I want a better deal for Europe too. So I speak as British prime minister with a positive vision for the future of the European Union. A future in which Britain wants, and should want, to play a committed and active part." "There are always voices saying: "Don't ask the difficult questions." But it's essential for Europe - and for Britain - that we do because there are three major challenges confronting us today. 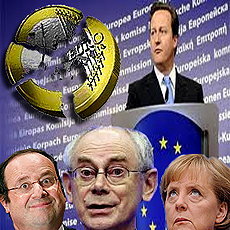 First, the problems in the eurozone are driving fundamental change in Europe. Second, there is a crisis of European competitiveness, as other nations across the world soar ahead. And third, there is a gap between the EU and its citizens which has grown dramatically in recent years. And which represents a lack of democratic accountability and consent that is - yes - felt particularly acutely in Britain. I do not want that to happen." "There is a growing frustration that the EU is seen as something that is done to people rather than acting on their behalf. And this is being intensified by the very solutions required to resolve the economic problems. "People are increasingly frustrated that decisions taken further and further away from them mean their living standards are slashed through enforced austerity or their taxes are used to bail out governments on the other side of the continent. "We are starting to see this in the demonstrations on the streets of Athens, Madrid and Rome. We are seeing it in the parliaments of Berlin, Helsinki and the Hague. "And yes, of course, we are seeing this frustration with the EU very dramatically in Britain." "At the core of the European Union must be, as it is now, the single market. Britain is at the heart of that single market, and must remain so. "But when the single market remains incomplete in services, energy and digital - the very sectors that are the engines of a modern economy - it is only half the success it could be. "It is nonsense that people shopping online in some parts of Europe are unable to access the best deals because of where they live. I want completing the single market to be our driving mission." "Can we really justify the huge number of expensive peripheral European institutions? Can we justify a Commission that gets ever larger? "Can we carry on with an organisation that has a multi-billion pound budget but not enough focus on controlling spending and shutting down programmes that haven't worked? "And I would ask: when the competitiveness of the single market is so important, why is there an environment council, a transport council, an education council but not a single market council? " "The members of the eurozone should accept that we, and indeed all member states, will have changes that we need to safeguard our interests and strengthen democratic legitimacy. And we should be able to make these changes too. "Some say this will unravel the principle of the EU - and that you can't pick and choose on the basis of what your nation needs. "But far from unravelling the EU, this will in fact bind its Members more closely because such flexible, willing cooperation is a much stronger glue than compulsion from the centre." "Power must be able to flow back to Member States, not just away from them... Countries are different. They make different choices. We cannot harmonise everything. For example, it is neither right nor necessary to claim that the integrity of the single market, or full membership of the European Union requires the working hours of British hospital doctors to be set in Brussels irrespective of the views of British parliamentarians and practitioners. "In the same way we need to examine whether the balance is right in so many areas where the European Union has legislated including on the environment, social affairs and crime. "Nothing should be off the table." "There is not, in my view, a single European demos. "It is national parliaments, which are, and will remain, the true source of real democratic legitimacy and accountability in the EU." "Democratic consent for the EU in Britain is now wafer thin. "Some people say that to point this out is irresponsible, creates uncertainty for business and puts a question mark over Britain's place in the European Union. "But the question mark is already there and ignoring it won't make it go away. "In fact, quite the reverse. Those who refuse to contemplate consulting the British people, would in my view make more likely our eventual exit. "Simply asking the British people to carry on accepting a European settlement over which they have had little choice is a path to ensuring that when the question is finally put - and at some stage it will have to be - it is much more likely that the British people will reject the EU. "That is why I am in favour of a referendum. I believe in confronting this issue - shaping it, leading the debate. Not simply hoping a difficult situation will go away." "The next Conservative Manifesto in 2015 will ask for a mandate from the British people for a Conservative government to negotiate a new settlement with our European partners in the next Parliament. "It will be a relationship with the single market at its heart. "And when we have negotiated that new settlement, we will give the British people a referendum with a very simple in or out choice. To stay in the EU on these new terms; or come out altogether. "It will be an in/out referendum." "Hundreds of thousands of British people now take for granted their right to work, live or retire in any other EU country. "While Norway is part of the single market - and pays for the principle - it has no say at all in setting its rules: it just has to implement its directives." "I say to our European partners, frustrated as some of them no doubt are by Britain's attitude: work with us on this. "Consider the extraordinary steps which the eurozone members are taking to keep the Euro together, steps which a year ago would have seemed impossible. "It is hard to argue that the EU would not be greatly diminished by Britain's departure." "With courage and conviction I believe we can achieve a new settlement in which Britain can be comfortable and all our countries can thrive. "And when the referendum comes let me say now that if we can negotiate such an arrangement, I will campaign for it with all my heart and soul. "Because I believe something very deeply. That Britain's national interest is best served in a flexible, adaptable and open European Union and that such a European Union is best with Britain in it. "Over the coming weeks, months and years, I will not rest until this debate is won. For the future of my country. For the success of the European Union. And for the prosperity of our peoples for generations to come."